Please refer to our stock # 604 when inquiring. SOLD...thank you very much I. !! 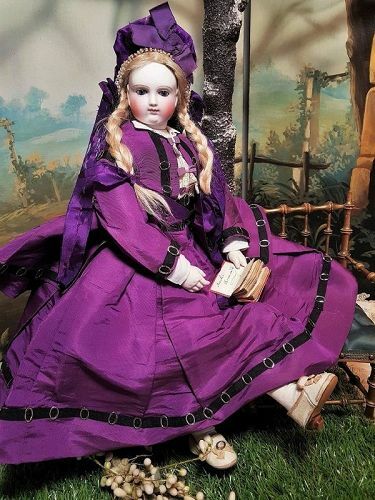 From a rich private house at country side of France comes this rare and all original early 18" ( 46 cm ) Mademoiselle with name " Amelie " in her all original clothing and perfect condition. From the same time era of Huret ...... an early fashion doll from circa 1858 / 60 with very gentle expression of round facial features , has luxury body with exquisitely sculpted bisque hands , very beautiful face whose pale bisque is dramatized by her brilliant eyes . Has lovely original blonde wig and very beautiful original color full silk enfantin costume !!!! An stunning and rare early fashion girl in generally all perfect condition ..... she is free of hairline , damage , chip or head repair. Wonderful original blonde mohair wig with long braid over cork pate . Original luxury poupee body ...... kid over wood with gusset jointing at hips and knees , has wonderful bisque arms to above the elbows with cupped fingers with defined nails . She has wood under legs and feet and has generally excellent body condition .... note only fine repair at her fingers at one hand ....please see my pictures !! Thank you for your kind interest on my Doll-Shop and please let me know if you have any question. Layaway are always welcome , but please ask me about .... thank you ! !